HOLYOKE—Ten were on stage for Monday’s debate, but come November 7, four will go home including at least two incumbents. Given the tamest—or perhaps least vitriolic—mayoral campaign in years, the at-large Council race has grabbed residents’ attention. Though all eight incumbents are seeking reelection, a 2015 ballot question eliminated 2 seats starting next year. The Holyoke Youth Task Force (HYTF), the Greater Holyoke Chamber of Commerce and the Holyoke Taxpayers Association sponsored the debate. All candidates—eight incumbents and two challengers—appeared to make their plea to voters. Although men have dominated Holyoke at-large Council seats, the debate’s standout were the two women candidates. Holyoke has elected more women recently than its larger urban siblings along the Connecticut River, Chicopee and Springfield. Besides at-large incumbent Rebecca Lisi, three ward councilors, four School Committee members, the Treasurer and the Clerk are women. However, for multi-seat at-large races, it has never been easy, especially given city political dynamics and voter behavior like bulleting. In Monday’s debate, Lisi, already noted for her progressive wonkiness, and challenger Deborah Aloisi dominated the policy end of the conversation. Everyone spoke in favor of youth engagement or economic development, but few broke issues down, developed a global picture and maintained a technocratic mien like Aloisi and Lisi. Throughout the debate, Aloisi returned to the subject integrating it into public safety and economic development. For her part, Lisi expanded beyond the scope of questions. On a question about the “unsightly mess” in the city, she pivoted to a broader, more human issue: panhandling and homelessness. “When I hear people saying this to me on the doors, the way I understand this question, they’re talking about the panhandlers,” she said. Lisi pointed to a task force on this issue she and Mayor Alex Morse have worked on and reiterated an idea to employ panhandlers, funded through donations. Policy chops is not necessarily enough, however. In a city like Holyoke, an ex-mill town historically dominated by white ethnics, ideas have not always won out. Personality, friends and connections have—and still do—reign supreme at City Hall and the ballot box. Yet, the sag in the field was not among Holyoke’s longest-tenured councilor. Joseph McGiverin and Peter Tallman, respectively the first and second most-senior members, kept pace with self-deprecation and frequent praise for public service. Both also made appeals to the city’s Latino community. McGiverin recognized its business owners and Tallman acknowledged the crisis on Puerto Rico—his wife is Puerto Rican. Rather incumbents with only a few years of service were resting the most on biography. Substance, if not platitudes about building the tax base and listening, were in short supply among Daniel Bresnahan and Howard Greaney’s answers. Aside from two yes or no questions asked by moderator and top area political consultant Anthony Cignoli, Youth Task Force members posed questions. The subjects ranged from the need to cooperate with the Chamber of Commerce to economic development to youth engagement. Questions about Chamber cooperation were freebies, but candidates may have let their guard down as a result. The subjects shifted to more complicated areas of economic development or quality of life matters. The discussion about youth engagement was particularly revealing. A ten year “Youth Vision Plan” was on display in the gleaming Holyoke Senior Center hosting the debate. In addition to asking about outreach to Holyoke’s huge youth population—33 percent—the HYTF panel asked how councilors would implement the youth plan. No one bombed the subject outright, but some candidates had little to say. “I believe communication is probably the most—the best way to deal with the problems of youth, middle-aged people, senior citizens, and I listen very well,” Greaney replied to a youth plan implementation query. Adorably, he added he had children and grandchildren who gave him perspective. He did not indicate if they knew anything about the Youth Plan. Others did better. James Leahy, another incumbent, highlighted education while discussing youth engagement. He went into more detail though. Leahy said the city should consider programs to assist young Holyokers afford bus passes and driver education programs. 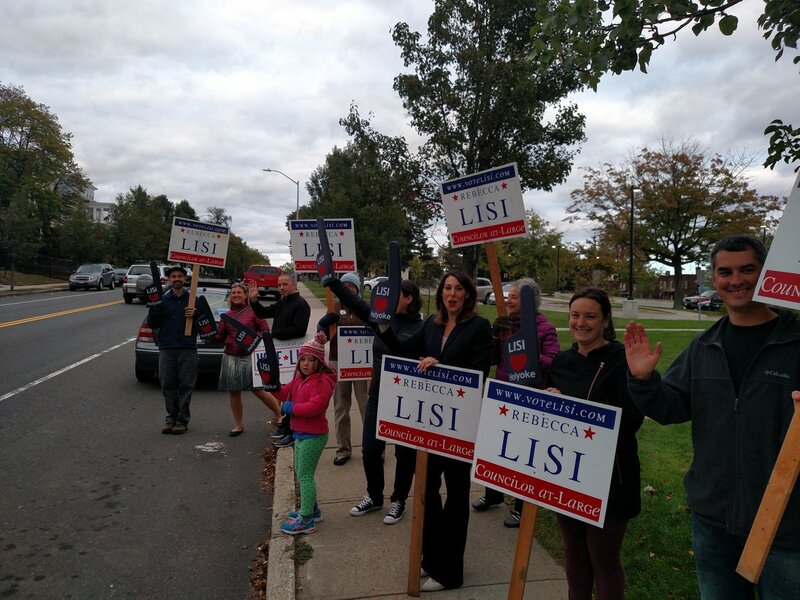 Lisi echoed that sentiment, adding that Holyoke needed more programs that give young people a voice in City Hall. She mentioned the youth commission and a 2012 order she sponsored with current mayoral aspirant and then-Councilor Jason Ferreira to add a youth seat to the Council. “I think we can work more closely with those youth as mentors to create a pathway forward,” Lisi said. There were also two yes or no questions. One concerned candidates’ commitment to passing an ordinance directed at retail, reportedly around the Holyoke Mall. It has languished in committee for some time. All committed to support it. The other yes/no concerned removing the Council’s president’s unilateral power to appoint committee and put those appointments to a vote of the body. Candidates unanimously backed this, too. This seemed aimed at retiring Council President Kevin Jourdain. Critics have accused Jourdain of controlling the body’s agenda through committee assignments. While the debate shifted among the wonky, the folksy and the shallow, others took the opportunity to atone. Michael Sullivan, who faced wide-spread condemnation for declaring “Don’t feed the animals” in reference to panhandlers, closed with a clarification. “As far as the opioid crisis goes, I’ve been accused of being callous or uncaring,” Sullivan said. “I just want everybody to know, I care greatly and have been very much involved,” he continued adding he had been in touch with local and state officials to help address the issue. One disappointment from the evening was the poor preparation of candidates Paul Bessette and Diosdado Lopez. This comes at a time when minority and/or lower ward representation in the at-large ranks is desperately needed. Besette, a first-time candidate, had an excuse. Diosdado Lopez, a former longtime ward councilor and now an at-large incumbent appointed to fill Jennifer’s Chateauneuf’s seat, did no better. At best, he echoed the same platitudes other candidates uttered or he offered lines about knowing all of City Hall’s players. It was a lackluster showing for someone who represented an under-served ward for 20 years. By design, the debate’s intention was to draw answers out from councilors. As had been remarked throughout the debate, the Council’s shrinkage has made the contest particularly spirited. Normally the mayor’s race steals voters’ attention. With Morse and Ferreria, the challenger, seeking a four-year term, that race remains November’s draw. But voters here and obviously the candidates do seem to realize the implications of the changes coming into effect. With only a few hundred votes separating the lowest-placing winners in 2015, some candidates are changing up or going back to the political roots to ensure survival. In a multi-seat at-large race, little things may matter as much as dominant factors like name-recognition and family ties. These factors and the decision of all eight incumbent to run for six seats makes Aloisi and Bessette’s tasks all the more difficult. Still, they persisted. “I will be looking at local policy through the lens of a social worker,” Aloisi said. After reiterating her focus on blight, accessibility and public health she closed with, “I am your neighbor for transparency and responsibility in local government. Of course, humor stills wins votes, too. Tallman drew laughs by ending on a positive note, of sorts, about the city. “Don’t sell Holyoke short, vote for the Tall-man,” he said not altogether jokingly.